Samsung Electronics Co. (005930), Asia’s largest consumer-electronics company, reported a record quarterly profit on surging sales of Galaxy phones and proceeds from selling its hard-disk drive business. Operating profit at the telecommunications unit jumped 81 percent to 2.6 trillion won, according to the median of six analyst estimates surveyed by Bloomberg News. Sales at the world’s second-largest handset vendor may have gained 36 percent to 16.45 trillion won. 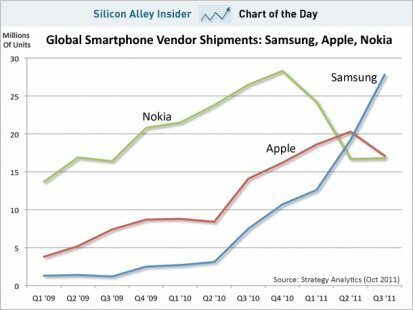 Samsung overtook Apple in the third quarter to become the world’s largest smartphone seller after shipping 27.8 million units, market researcher Strategy Analytics said in October. Samsung’s smartphone sales more than tripled during the three- month period from a year ago, and its market share more than doubled, it said. Samsung probably sold about 32 million smartphones in the fourth quarter, according to an estimate from Dongbu Securities Co., helped by the Galaxy range of devices. Galaxy S II sales, which began in May, surpassed 10 million units quicker than any other Samsung mobile device, the company said in a December statement, without providing a total sales figure for the model.